Every iBooks Edition contains new and exclusive content that you can’t find anywhere else. He’s lost his fortune… She’s nursing a broken heart…When fate steps in, will love prevail? Pete Finnegan had it all—money, power, status, a future wife, until he lost it all in one huge financial “gamble.” Now he’s back in his hometown of Magdalena, trying to figure out what to do with his life. When Nate Desantro offers him a job fixing up a cabin one hundred miles away, he jumps at the opportunity. Peace and solitude in the woods away from busybodies and do-gooders, is exactly what he needs to contemplate his future. But Pete doesn’t expect to find a beautiful woman staying at the cabin. Elissa Cerdi has escaped to the Blacksworth cabin to heal her broken heart. As Gloria Blacksworth’s former caregiver, she’s agreed to honor the dead woman’s last request by mailing letters to select residents of Magdalena. When Elissa meets Pete, she doesn’t know he has ties to Magdalena, and she certainly doesn’t know the final letter she plans to mail is about his father. Pete and Elissa are both in need of healing and maybe that’s why they agree to shut down the outside world and pretend nothing exists but what’s inside the cabin. Could that also be why they’re able to open up to one another, talk about disappointments, hurts, betrayals, and hopes? Is that why passion consumes them, burns them with a need they’ve never felt before? Is it so powerful because it isn’t real? When Pete uncovers the truth about Elissa’s part in Gloria Blacksworth’s cruel scheme for vengeance, he feels betrayed and questions everything that happened in the cabin. As weeks pass and the couple forge separate lives, Pete must decide if he can open his heart once again to forgiveness and love. This iBooks Edition contains: a bonus scene with a different plotline involving Elissa Cerdi and a stalker ex-boyfriend. Note: Gloria Blacksworth’s letters aren’t the only ones floating around Magdalena. When Nate and Christine Desantro visit the cabin, they discover six letters written by Charles Blacksworth that could change lives forever. Now they must decide what to do with them. Stay tuned! Do you love A Family Affair: The Cabin book? Please share! Another great story, but it's always so hard when the end arrives so quickly! 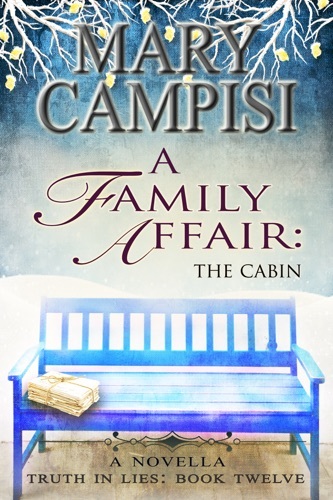 A Family Affair: The Cabin - Mary Campisi E-Book coming soon..